Only three things are certain in life. Death, taxes and society's love of sharks. Case and point, The Meg blew past all expectations this weekend to top the domestic box office with a huge $44.5-Million North American debut. The Warner Bros. flick, based on the excellent Steve Alten book, follows the success of Sony's The Shallows, which grossed $119-Million globally in 2016. That was followed by 47 Meters Down released in theatres last summer, which earned a very healthy $44.3-Million against a $5.5-Million budget. The Meg also marks the studio's biggest opening of the year to date, passing the $41.8-Million premiere of Steven Spielberg's Ready Player One back in the spring. The big budget flick is also showing some teeth overseas with an early global total of $77.4-Million thanks to strong performances in multiple foreign markets. Directed by Jon Turteltaub, The Meg stars Jason Statham alongside Li Bingbing, Rainn Wilson, Ruby Rose, Winston Chao and Cliff Curtis. To date, Steven Spielberg's Jaws still remains the highest grossing live-action shark film in North America, adjusted for inflation or not. 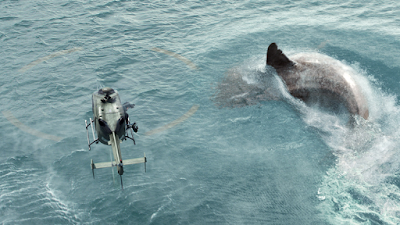 That film swam into theatres in 1975, and is considered by many to be the first summer blockbuster in Hollywood history.